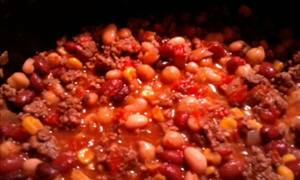 Very tasty protein packed three bean chili, good for a cold night. Brown onion in pot with cooking spray like Pam. Add ground turkey, brown. Add all other ingredients and allow to come to a boil. Spice with cumin, cinnamon, sea salt, and cayenne pepper. Simmer over medium heat for 15 minutes. 119 members have added this recipe to their cookbook. what is a serving size 1 cup? It was delish! To tone it down for the kids I added a touch of brown sugar to their servings. There are 212 calories in 1 serving of Three Bean Chili. Calorie break-down: 5% fat, 63% carbs, 32% protein.